This article describes the ABCD Trust Model, developed by Ken Blanchard in a practical way. After reading you will understand the definition and basics of this powerful leadership and coaching tool. What is the ABCD Trust Model? 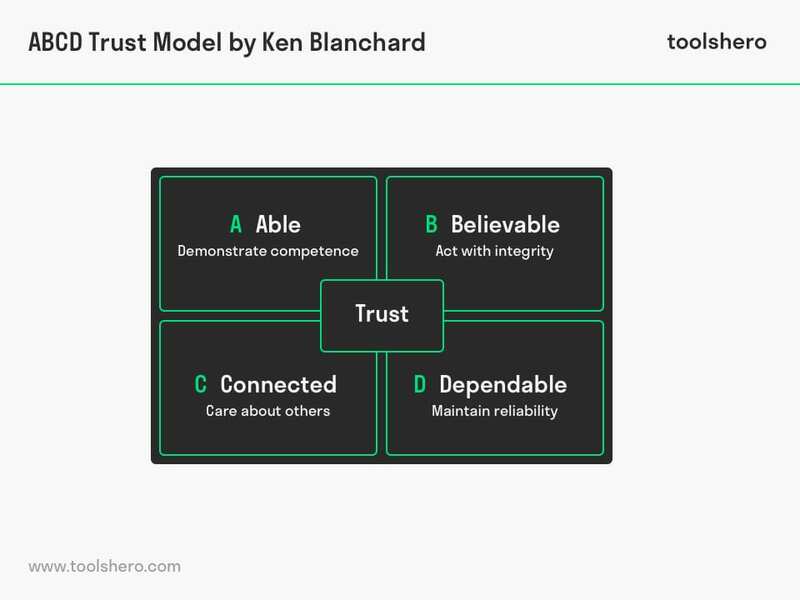 The ABCD Trust Model was designed by Ken Blanchard. The American is mostly known for being a management and leadership guru and developed the Situational Leadership Model together with Paul Hershey. In addition, he wrote the international best seller ‘The One Minute Manager. In 2013, his book ‘Trust Works’ was published, in which he discussed the ABCD Trust Model. The foundation of this model is giving and receiving trust. What is trust? How is trust built among people? What happens if the trust is broken? According to Blanchard, there are a number of common elements that decide what trust is. He calls this the ABCD model, in which each letter stands for a word: Ability, Believability, Connectedness and Dependability. Based on these elements, the status of mutual trust in a relationship between people can be determined. Next, people can discuss with each other how the trust in each other can be increased. According to Ken Blanchard, trust is expressed in actions and behaviour; words alone are not enough. He distinguishes between trust breakers and trust makers. Actions that systematically dismiss other people’s work and ideas, are true trust breakers according to him. Recognition for the work of others, appreciating and supporting them on the other hand and are true trust makers. Ken Blanchard refers to low trust as Low T(rust). People with Low T do not feel good about themselves and experience a lack of emotional connections to the people around them. They are not able to share important information with others and often feel that they are being excluded by others. Both employees and managers deal with Low T in their work. By recognising and understanding the causes of Low T, they are better able to regain their trust in themselves and others. The treatment of Low T involves the previously mentioned ABCD model. It is necessary to understand and apply the four elements of trusts in daily behaviour in order to counter Low T.
By showing ability, a person’s environment starts to trust someone’s actions. A certain level of expertise is expected from managers. If they do not show that they have that expertise, employees will have less trust in their manager. Demonstrating their competencies will inspire others and increase trust in the manager. By acting with integrity, managers show that they are honest and will not harm their employees’ trust in them. People expect that they behave in accordance with the standards and values or the organisation. It is their task to carry out the company policy in a believable way and act accordingly. By being genuinely interested in their colleagues and employees, managers show that they are involved with and connected to their environment. They are able to listen to others well, and they have good communication skills and contribute to a pleasant work atmosphere. This caring attitude by the manager will rub off on the employees, which will be beneficial for a team’s cooperation. Showing that others can depend on the manager will lead to a positive response from their environment. They manager would do well to really stick to agreements and be consistent in that respect. Employees and other’s regard for their manager will increase if a manager actually delivers on his promises, within the time that was agreed. By implementing what has been discussed above, a manager can work on building a good and long-lasting relationship of trust with his employees and colleagues. The ABCD is the foundation for the so-called ‘language of trust’. The more managers, the more reliable they will become to their employees and the rest of their environment. What do you think? What is your experience with the ABCD Trust Model? Do you recognize the practical explanation or do you have more additions? What are your success factors for good team management and gaining trust within a team? Blanchard, K., Olmstead, C., & Lawrence, M. (2013). Trust Works! : Four Keys to Building Lasting Relationships. Harper Collins.